Dust off your passports and join our Ice Skaters as they become your tour guide for our River Blades Travel Adventure on ice!!! You don’t want to miss being a part of this WORLD tour on ICE. It’s an entertaining show packed with our very own star-studded tour guides. Register today to perform in fun group skating routines, duets, solos, with guest appearances, & much more!!! I have attached the schedule. Locker room assignments will be listed at the front table. Cast photo on ice immediately following dress rehearsal & show night) Dress rehearsal we will take a photo in costume & with t-shirts on. Show day we will take a pic in costume immediately following the show. The morning of show day we may need you to skate an extra rehearsal in the morning. 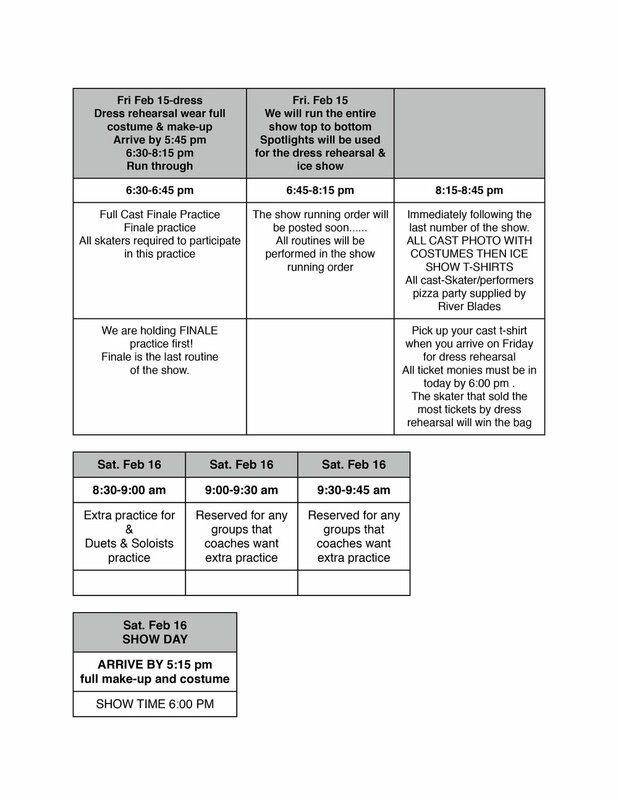 We will let you know the night of dress rehearsal which groups will need to attend the morning practices. Arrive @ 5:15 pm fully dressed-find your designated locker room. Bring a snack and water for your skaters. All skaters will sit in the designated skater area with Melissa Jensen & Natasha Isadore- the skaters will sit in the skater area while the show is going on-please bring a blanket and have your skater wear a robe to cover their costume. Line up 3 numbers before your routine. If your skater needs assistance with costume changes a parent will need to assist that skater. If your skater is too young to sit on their own with the chaperones they may sit with parents with a robe covering their costume. ABSOLUTELY NO CAMERAS OR PHONE USE IN THE LOCKER ROOMS FOR OUR MINORS SAFETY-the only area for photos are in the lobby, on the ice and in the back stage line up area. DO NOT USE FLASH PHOTOGRAPHY during the show it blinds the skaters. If your skater is using a phone in the locker room we will take the phone and give it back to them after the show. Please advise your skater on this. REMAIN SEATED WHEN THE LIGHTS ARE OUT. Remind family and friends they can purchase a postcard for their favorite skater and place it near their passport -We have passports just for the River Blades skaters that registered for the show. Each family was given 10 tickets to sell-we hope you can sell at least 10 tickets to family & friends. Our ice show ticket sales cover ice time for dress rehearsal, show day ice time, choreographers, skater swag bag gifts, program design, pizza party, spotlight rental, props & other fees associated with the show. Turn in your ticket money and any unsold tickets to Karey Rother no later than 6pm the evening of Dress Rehearsal (NEXT FRIDAY2/15). She will be available during all skate show practices, and at skating school from 10-11:30 2/9. If you need more tickets please let her know. HELP DADS/MOMS we need your help setting up at 4:55 pm-we need 10 dads/moms to help hang the curtain & hang plastic covering on the boards arrive by 4:45 pm on show day. The excitement is building for our Travel Adventure production on ICE.Listen in to Hastings KDWA radio Mo interview director Amanda about our ice show. Please share the interview of our ice show on your social media outlets with friends & family!!!!! please share River Blades Facebook page on your facebook page. 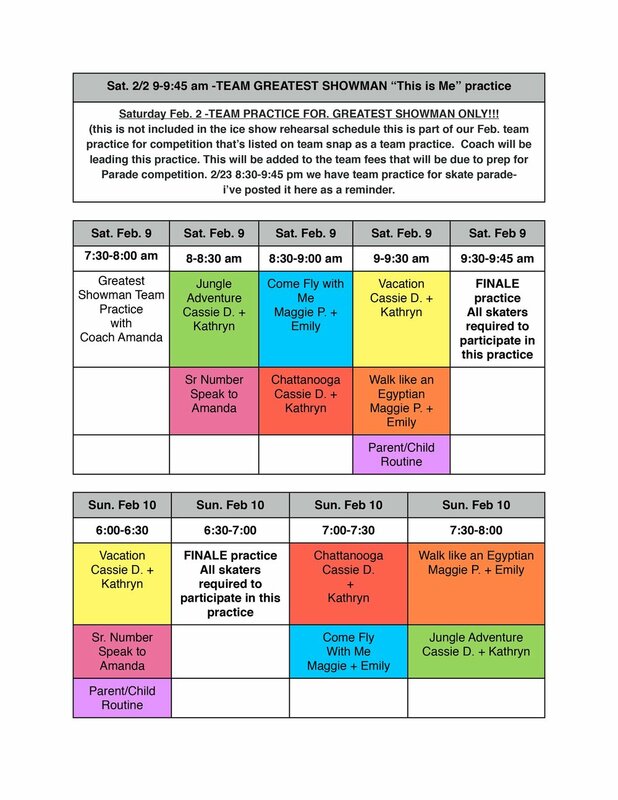 Duets & Soloists will work on routines in their private lessons not during the group practice times listed - must be registered for the ice show in order to participate in a solo or duet. Arrive with hair & make-up ready. Put your costume on at home. Don't forget to put your over-the-boot tights on before you put your costume on. Skaters will watch the show together near the locker rooms. Costumes must be covered with a robe. Skaters must be lined up in the hallway 3 routines before their group routine or solo. If your skater has multiple changes/quick changes, parents will need to come down during the show & assist their skater in the dressing room for the quick change. You may pre-set your quick change costume in the locker room closest to the ice. Please be aware of others changing in the locker room-no cell phone use. We realize it can be stressful having quick changes. Please keep in mind we want to keep the dressing rooms a positive atmosphere for everyone. If your skater and parent are having a "moment of stress" please take a moment to breathe & know it will all be okay. Please advise your child ahead of time that if they do have a quick-change to breathe, stay calm, and positive. Be sure to check for your dressing room assignments upon arrival. A list will be available on the front table. All dressing rooms will list group names. Please be dressed, hair and make-up ready upon arrival. No males in the locker rooms. Absolutely NO cell phones in the locker rooms. If a skater is using a cell phone in the locker room their cell phone will be given to the locker room mom who will hold it until the end of the show. All locker rooms must be free of trash & no items may be left in the dressing rooms. If you leave an item there is a lost and found in the lobby. Skaters will sit in the designated skater seating area near the skater ice entrance for the show. We will have designated parents to chaperone the skater seating area-skaters are not able to sit with their parents during the show unless your skater is age 4/5 years old. Skaters will sit with the group they perform with. There are rentals immediately following our dress rehearsal & show. Please exit the dressing rooms when you are changed. If your items are not removed immediately following the show, you will have to wait until the hockey players are out of the locker room to re-enter. Please pick up your skaters swag bag gift & skater “ Travel Advenure wishes” from the lobby upon your departure. Swag bag compliments of Riedell Skates & Strauss Skate Shop. Each skater will have a special “Travels Adventure” skater passport with their name on it at the show. We encourage friends & family members in attendance to write a "skater wish" on the postcards available for purchase $1 and tape it near their favorite skater’s Travels Adventure skater passport. Skater wishes will be for sale on Saturday 2/16 at Skate school & the evening of the show (we will not be selling flowers the night of the show.) Skater wishes are a fundraiser to off-set some of our ice show expenses & should be picked up by your skater at the end of the show. Please scroll down to see hair and make-up for each group performing in the River Blades Travel Adventure Ice Show. Thank you for being a part of our 2nd Annual themed ice show. Sparkle & Shine!!! Female skaters are required to purchase Mondor over-the-boot tights, style #3396. Select button below to purchase on Amazon. The link to the costume you are wearing is listed below. Please steam your costume before our photo shoot. No eating in costume. Please wear a robe over your costume for dress rehearsal & the show. Popsicle-ette Team-Hair in high pony tail curled, over the boot tights. Greatest Showman Production Team-Hair parted on the left side low bun on the back of the head, over the boot tights with black fishnets. Come Fly with Me-Hair parted on the left side low bun on the back of the head, over the boot tights. Chattanooga-Hair parted on the left side low bun on the back of the head, over the boot tights. Jungle Adventure-Hair parted on the left side low bun on the back of the head, over the boot tights. Walk like an Egytian-Hair parted on the left side low bun on the back of the head, over the boot tights & black fishnets. Daddy/Daughter-Wonderful World-Hair in a high pony tail curled, over the boot tights. January 10th, 2019 is the deadline for ad & business card JPG. Purchase your skater a “Skater Wish” for $15 and be included in River Blades Travel Adventure Ice Show Program. Please write check to River Blades - memo line “Skater Wish”. Great as a keepsake for your skater! Includes one photo and comments plus a passport on the River Blades Travel Adventure Map! It’s easy! 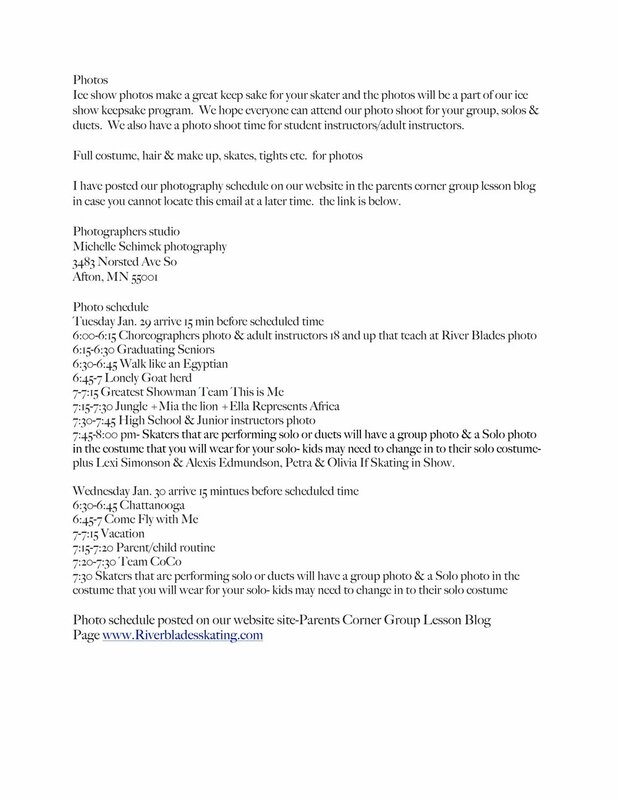 Complete the form below and send a picture of your skater to Amanda@RiverBladesSkating.com. Pictures must be received by January 14th.